A virus easily spread among trout and salmon could make it harder to keep your favorite fish on the menu. 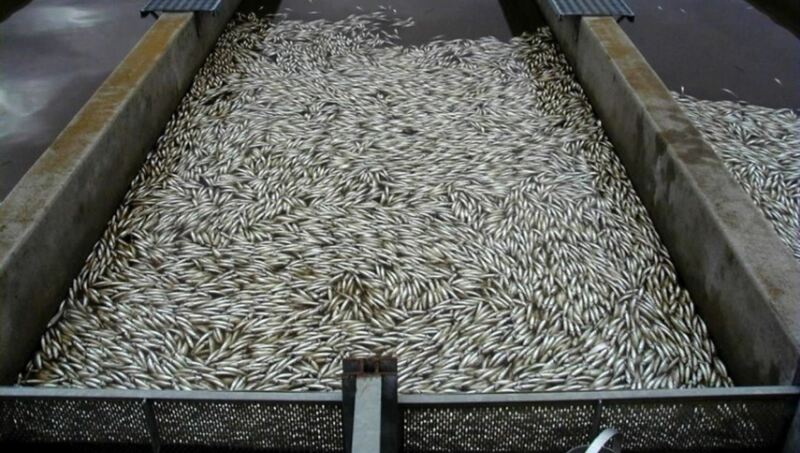 The image of dead and dying fish below is from a fish hatchery in the middle of an epidemic of infectious hematopoietic necrosis virus (IHNV). The easily transmitted virus affects species of salmonid fish, including trout and salmon. Don't drop your fork, but the virus that causes IHNV is from the family, Rhabdovirida — a viral group that includes one virus familiar to humans — rabies. In a study published in Ecology and Evolution, researchers from the Cary Institute of Ecosystem Studies examined how the virus spreads among juvenile fish, which are more vulnerable to the disease than older fish. The virus has a big impact on fishery efforts throughout the Pacific Northwest. Affecting wild and farmed, young and adult fish, the virus is an often fatal disease that destroys tissue and function in the kidney and spleen of infected fish. Sick fish often experience "pop-eye" and darkening of the skin. Strains of the virus impact fish species differently. For example, the "U" subgroup of IHNV is more lethal to sockeye salmon, while the "M" subgroup is more harmful to fish like rainbow and steelhead trout. "IHNV disease costs Pacific Northwest conservation efforts and the global aquaculture industry millions of dollars annually," study researcher Gael Kurath, of the University of Washington, said in a press release. "These expenses include direct losses due to fish mortality or culling of infected fish and eggs, costs of routine surveillance and testing, and program losses due to restrictions of movement of infected fish." Study authors believe the pathogen causing this damage in hatcheries has been circulating among Pacific salmon for thousands of years. Human alteration of the course and use of streams and the ecosystem, along with hatcheries, have created ripe conditions for the spread and sustainability of IHNV. The virus was identified in the 1950's in the Pacific Northwest and has since spread throughout the US, Canada, and abroad to Asian and European countries. Transmitted by infected fish eggs, the virus also spreads through trade in fish that are infected. Researchers first identified the disease in Atlantic salmon in the 1980's. Other fish could be vulnerable to the virus, including the sturgeon, which some researchers suggest could be a possible vector for the virus. Studies to develop a vaccine to the virus are ongoing, but for now, the only defense against the virus is prevention — there is no viable treatment to save infected juvenile fish. 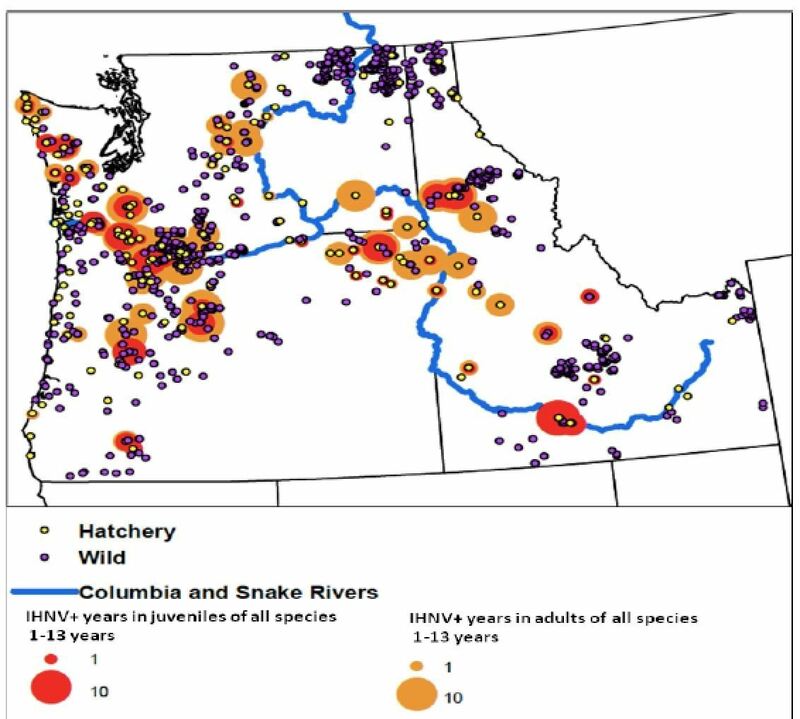 Map of the Pacific Northwest depicting IHNV prevalence over the 2000-2012 time period per hatchery site (yellow circles) and wild site (purple circles). Sites where virus was detected are surrounded by rings scaled by number of years with IHNV detected in adults (orange) and juveniles (red). Also depicted are the Columbia and Snake Rivers (blue). Image via Breyta et al. In this study, the research team looked at database surveillance records from hatchery sites located in the Pacific Northwest. 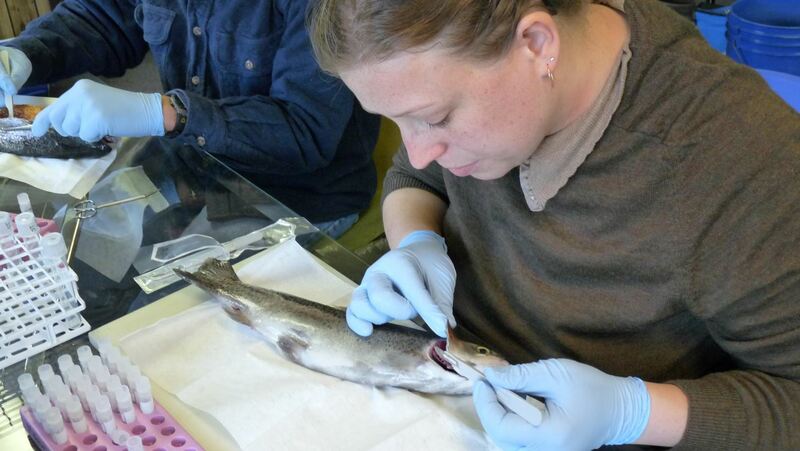 The USGS Western Fisheries Research Center conducts IHNV genotyping for these fisheries to track and identify affected fish and hatcheries. By analyzing data, and assessing hatchery characteristics like size and prevalence of outbreaks, the research team identified groups and potential pathways of infections between the years 2000 and 2012. The scope of the study was huge. There are seven independent agencies on the state, tribal, and federal level that operate over 100 hatcheries in the Pacific Northwest. The team scrutinized 6,766 records from 1,142 different locations. These places would be hatchery sites, fish traps, ladders, or weirs — which are small dams. The data came from Washington, Oregon, and Idaho, and included 12 privately owned fish farms and 144 natural sites where fish are sampled and tested. The study confirms that susceptible juvenile and adult fish are maintaining IHNV. The team identified three infectious pathways. One route of viral transmission is the shedding of viral material by returning or spawning adults in water that makes its way into fisheries. A second route is between fish in hatcheries where the disease is present. A third route is between hatcheries when fish move from one facility to another. Because fish shed the virus into the water where it infects other fish, some hatcheries have implemented water use policies to keep juvenile fish from being exposed to waterborne pathogens. But changing water supplies to underground springs or other water is expensive and sometimes simply not possible. Fish eggs are usually treated to prevent passage of the virus from egg to newly hatched fish. Scientists found less IHNV in wild fish they tested. This could be due to a variety of reasons — one being that fish sampled are caught healthy, while dead and dying fish would be less likely to be sampled. Infected juvenile fish and infected migrating adult fish are likely to play important roles in spreading IHNV. We expect that our efforts to better understand viral transmission will lead to more targeted management strategies. Disrupting transmission is key to stopping the expansion of this virus, which is a conservation threat and an economic liability.